Our Friday series on setting up and operating a private practice continues. 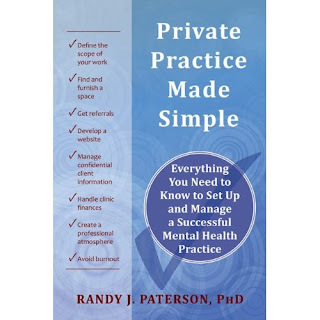 The series is based on my book Private Practice Made Simple (New Harbinger Publications, 2011) and the workshop of the same name appearing in 5 Canadian cities this month. Past posts have considered the decision whether or not to leap into the field, naming your practice, identifying the populations you wish to see, finding office space, preparing the space, and brainstorming about your possible referral sources. That last post included a link to an exercise sheet that I said would take quite a while to complete. So this week you get a break from the forms, and hopefully I’ll save you some funds while I’m at it. When you write a book, you hope that your content stays current for at least a few years. You also hope that you don’t go back and change your mind about some of the things you’ve said. 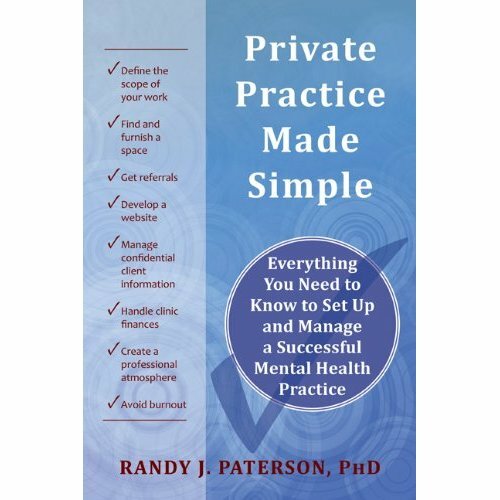 For the most part, I’m happy with Private Practice Made Simple. But, yes, I’ve already started my file for an eventual revision. There’s only one thing in it thus far. Yes, it’s time to dump the Yellow Pages. In the book I said that usage of the venerable Yellow Pages has been declining in recent years, but that it’s probably still a good idea to have your practice listed for the next few editions. Okay, but the curve is a bit steeper than I thought. Time to pull the plug. What makes me think this? First, I enquired around our clinic, and it appears that it has been upwards of two years since our print copy of the Yellow Pages has been opened, let alone used productively. In fact, it took a bit of doing to find it when I took the photo for this post. Second, no client in the past five years has so much as mentioned the Yellow Pages, despite our practice of asking how they heard about us. 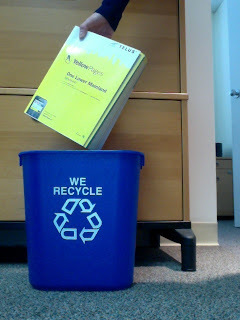 Third, we recently received the new copy of the Yellow Pages, which seems to be about a third the thickness of the one from just a few years back. As businesses drop their listings, the directory becomes less of a default reference for people. “Well, if all else fails, it’ll be in the Yellow Pages” is no longer true. Fourth, the online version of the Yellow Pages doesn’t seem all that useful. I’ve conducted Google searches for a number of businesses that have print listings in the Yellow Pages. In no case was the Yellow Pages listing the top appearance of the contact information in the search results. In most cases, the Yellow Pages listing didn’t even appear in the first few pages of results. So yes, if you have a Yellow Pages listing, it’ll also appear online. But if you have any other online presence whatsoever, this will be completely redundant and will add virtually nothing to your visibility. Remember WordPerfect? At one point it was the dominant word processing program. Now almost no one uses it. Word and Pages are the new WordPerfect. Well, Google is the new Yellow Pages. And it’s free. Save your money. This point may itself be redundant surprisingly soon. A year and a half ago, the value of the stock of the publisher of the Canadian Yellow Pages was over $6. As I write this, it is worth 11 cents. Even if you want to keep your listing, there may soon be no Yellow Pages to list in. And as for those rival general business directories (I’m talking about you, CanPages), my advice goes double. Save your money. Next Friday: The Practice Announcement. I couldn't agree more. It is certainly the end of an era for the YellowPages. A few years from now, a child born will have no idea why there is even such a thick book containing nothing but names and numbers. It will be horrendously obscure in time.